Goliath - Diamond in the Ruff Rescue & Rehab, Inc.
Goliath is a two year old DEAF, big boy, who came to us from PA Animal Control. He was confiscated along with an older male dog and cats. The owner was a drug dealer and user. Goliath and the other dog stayed inside, but when the owner wanted to party he would put the dogs outside. After a while, Goliath would bark to be let in the owner would beat him with a 2x4 until Goliath could no longer stand. Even during his beatings, Goliath never bit the owner. When Goliath was confiscated he had no hair but had nearly a thousand fleas on him. He was emaciated and his skin was cracked and oozing blood and infection. He could not be touched because of the pain. Goliath was taken to the vet where he received three blood transfusions and required a month of antibiotics. After many months physical recovering, Goliath was then healthy enough to be transported down to us. Today Goliath is trained in American Sign Commands and has regained trust in people. Goliath has adjusted to different men and women handling him and hasn't had any problems with them. Only on first introduction does Goliath barks loudly, (Deaf Dogs have a louder bark then hearing dogs) and is alert until he is introduced to them. Then he runs and gets his tennis ball to have them play fetch with him. However we have noticed that when new people arrive that are wearing sunglasses and ball caps, Goliath is put on alert by them. When these items are removed and he can see the persons whole face, he is more relaxed and accepting. 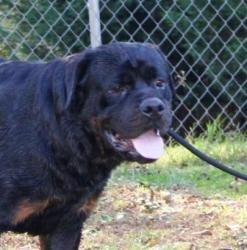 Goliath has been adopted into a loving home!